The British Library’s exhibition on Anglo-Saxon kingdoms is a triumph on two levels. Not only is it a magnificent display of early medieval masterpieces, but it also reclaims the intellectual high ground for the Anglo-Saxons at a time when the label ‘Anglo-Saxon’ is tainted by its use in some quarters as a byword for racial essentialism and when Britain finds itself in the midst of a debate over its future in Europe and the world. The exhibition mounts a resolute rejoinder to the perception that the people of England in the era between the collapse of Roman rule in the 5th century and the Norman Conquest in 1066 were isolated, primitive or ignorant. To make this point, the exhibition has brought together a unique body of written artefacts. Probably the single most impressive item is the gargantuan Codex Amiatinus (cat. no.34), the oldest surviving single-volume Latin bible, over one thousand large pages in length, written at Wearmouth-Jarrow at the beginning of the eighth century. This is the first time the Codex has returned to Britain since its departure in 716. In the full-page illumination of the dedication page (Fig.7), a scribe at work in front of an open cupboard containing a nine-volume bible is identified by inscription as the Old Testament prophet Ezra. Another manuscript returning from Italy for the first time in a millennium is the so-called Vercelli Book (Biblioteca Capitolare, Vercelli; no.87), a collection of religious prose and verse texts written in the tenth century. 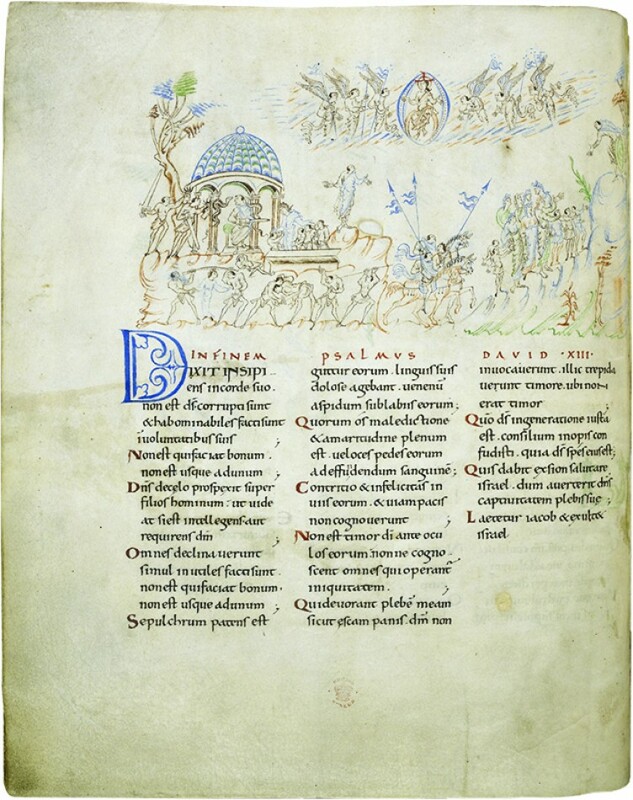 By securing its loan, the British Library has achieved the unprecedented feat of bringing together in one display case the four main manuscripts of Old English verse, consisting of the Vercelli Book, the Bodleian’s Junius Manuscript (no.89), Exeter Cathedral’s Exeter Book (no.90) and the British Library’s Beowulf manuscript (no.86). It is inevitable in any exhibition that depends so heavily on the written word that the manuscripts themselves serve a dual role, as both work of art and metonym – many of the books on display are astoundingly beautiful and charged with visual meaning, but the single visible opening of two pages in each book also represents the manuscript’s contents and its historical importance. Both aspects are explored in the exhibition. Its first half is essentially structured as a chronological tour through Anglo-Saxon history. The opening section, designated ‘Origins’, includes the highest proportion of objects (rather than manuscripts), as might be expected given the essentially preliterate nature of the earliest Anglo- Saxon settlers. Next come displays on the seventh and eighth centuries, a high point of cultural achievement in England, as Christianity took hold, leading to the establishment of many wealthy monasteries. The exhibition rightly showcases the ‘golden age of Northumbria’ in the era of the Venerable Bede (d.735) with such treasures from the British Library as the Lindisfarne Gospels (c.700; no.30) and the recently acquired St Cuthbert Gospels (c.700; no.32). The dominant midland kingdom of Mercia is the focus of another room, which brings the visitor to the dawn of the ninth century. Subsequent developments between then and the middle of that century saw activities shift to Wessex in the southwest. The strugg­les of that kingdom under Alfred the Great (871–99) and his heirs against the Vikings form the last leg of this perambulation through highlights of Anglo-Saxon history. The second half of the exhibition takes a subject-based approach and is entirely devoted to the last century or so of Anglo-Saxon England (c.950– 1066), re‑ecting the much larger quantity of material preserved from this period. Anglo-Saxon England, as interpreted in this tour de force, is a long way from Little England: these Englishmen and women are shown to have been outward-looking, curious and highly accomplished in art, scholarship and statecraft. Myths and assumptions about the Anglo-Saxons are dispelled – for example, by the caption to one scientific text, which reads ‘Not a Flat Earth’ – and several others call attention to the continued close links that England’s monastic institutions had with counterparts in France, Italy and elsewhere. To underline the point, an enlarged photograph of a world map drawn at Canterbury in the early eleventh century is prominently displayed alongside the cabinet containing the original. This portion of the exhibition is in many ways even more rewarding than the first. Moving through a series of small, intimate rooms that have the atmosphere of a cathedral treasury, the focus shifts from learning and intellectual history to art and religion. All these aspects are brought together in a display that combines the Utrecht Psalter (c.825; Universiteitsbibliotheek, Utrecht; no.137) with two copies made in England, all three opened to the same passage. 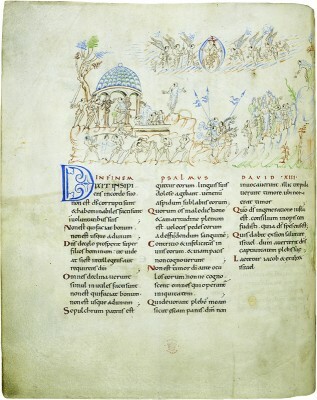 Made near Reims in northern Francia, the Utrecht Psalter must have been in the library of Canterbury Cathedral by the first half of the eleventh century, since the Library’s Harley Psalter (no.138; Fig.5) and the Eadwine Psalter (c.1150; Trinity College, Cambridge; no.139) demonstrate how English scribes adopted and adapted the Utrecht Psalter’s characteristic way of illustrating the psalms with sequences of fine line drawings at the top or bottom of each page. One of the final sections is ‘Conquest and Landscape’: an exploration of the eleventh-century kingdom of England, which climaxes with the Domesday Book. This celebrated account of who owned what property in the decades following 1066 is represented by three of the key surviving manuscripts, Exon Domesday (Exeter Cathedral Archives and Library; no.160), the Great Domesday Book (National Archives, Kew; no.161) and Inquisitio Eliensis (late 12th century; Trinity College, Cambridge; no. 159). With relevance to the whole of England, and enriched by superb use of maps and video displays, this is a highly appropriate note on which to end: an entire kingdom compressed into book form. Concluding with war after steering through the deep Anglo- Saxon appreciation for the word as art (and much else besides), Anglo-Saxon Kingdoms is this generation’s defining assertion of the maturity of England’s infancy. 1 Catalogue: Anglo-Saxon Kingdoms: Art, Word, War. Edited by Claire Breay and Joanna Story. 272 pp. incl. numerous col. + b. & w. ills. (British Library, London, 2018), £40 (HB) / £25 (PB). ISBN 978–0–7123–5202–4 / 978–0–7123– 5207–9.